Description: Bright, airy & inviting, this classic 3-bedroom ranch features a covered entry porch, vaulted ceilings, skylights, numerous ceiling fans, main-floor laundry & a sizable wood deck with lush golf course views. Lower level is finished with an expansive entertainment area & wet bar, bath & 4th bedroom. Open floor plan with fireplace enhancing great room & dining area, gleaming laminate flooring throughout the main-level activity areas. Bayed breakfast nook; newly remodeled hall bath & kitchen, including designer cabinetry, solid-surface counter tops, stainless range & built-in microwave. Dual vanity, jetted tub & separate shower in the owners’ retreat. Additional highlights: walk-in closets, tilt-in windows (some window treatments included), 3-year-old roof & new water heater. Located in the popular monticello community with clubhouse, pool & tennis. 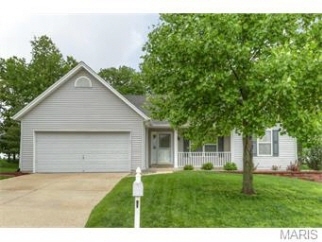 Easy commuter access to i-64/40 & just 10 minutes from chesterfield.